Huge amount of fashionistas maintain the desire to buy pieces from their favorite designer brands, which is sometimes impossible. Only few people can walk into a brand store and buy besides looking the gorgeous creations. That thought must have popped on the minds of the people working for the Swedish colossus H&M, when in 2004 they began their famous designer and celebrity collaborations; sixteen collaborations in only nine years. The first one was with -Kaizer- Karl Lagerfeld, followed by Stella McCaurtney and the -pop queen- Madonna. The next (and kind of bizarre) collaboration was with Maxis company and the computer game The Sims 2 for an expansion pack which provides H&M products for the players to dress their Sims in. We continue with huge designers such as Roberto Cavalli, the collection of the pop diva Kylie Minogue, Marinikko, Comme des Garsons and Mathew Williamson, who created two collections; the first one was a clothes’ line for women and -for the first time- men, and the second one was a bathing suit line. The list goes on with Jimmy Choo and his women’s and men’s shoe collection on November, 2009. The shoes cost ranges from $30 to $170. A big surprise were the clothes designed by the famous shoemaker. The success continues with the collection of Sonia Rykiel (knitwear and lingerie range), the french brand Lanvin, the fashion blogger Elin Kling (what a great honor! 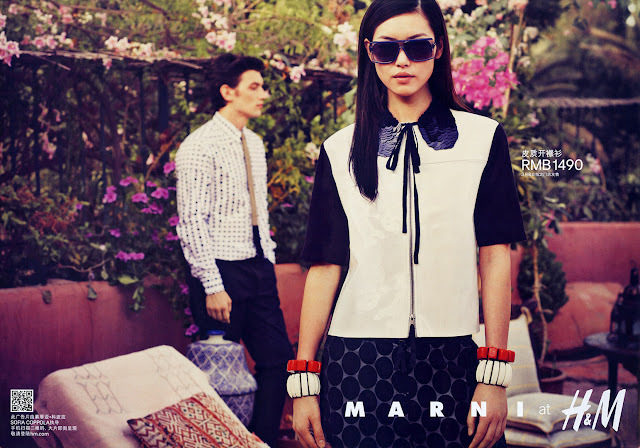 ), the legend designer brand Versace (beautiful collection) and Marni. The most recent collaborations was with David Bechkam that launched and modeled for his own underwear collection and then with -the Japanese Vogue Editor- Anna del Russo with a very successful (and really promoted) accessories and shoe collection. Sixteen successful and sold out collections; sixteen successful collaborations. Thousands of fashion lovers that fill the stores worldwide or place orders online on the official online stores or even on eBay, in much higher prices of course. I’m sure that the second largest global clothing retail company will continue to draw our interest with bizarre collaborations such as the one coming next with avante-garde label Maison Martin Margiela which hits the stores on November 15, 2012. Who knows? Maybe after November we could sing along with Kanye West and Jay-Z... “What’s my jacket... Margiela? !” and mean it! Great first post and welcome to the world of blogging!!! I have always loved H&M and the collaborations, let's see who else will jump onboard for 2013! All the best with the blog!